Why Choose Digestive Health Associates and Center of Reno? Digestive Health Reno is on the cutting edge of digestive health care in Reno. With a top-rated medical staff and board certified gastroenterologists, you can rest assured that a choice for Digestive Health Reno is the best choice for your health. More patients choose Digestive Health Reno for their gastrointestinal health care because every physician and staff member is dedicated to giving each patient exceptional care. According to 2018 patient satisfaction surveys, 86 percent of patients rate their experience at Digestive Health Center a 9 or 10, with ten equaling the highest level of satisfaction. Digestive Health Reno has earned a superior reputation among patients and the Northern Nevada community because the renowned team of expert gastroenterologists are dedicated to tailored, top-level care in the diagnosis, treatment, and care of each patient. The gastroenterologists of Digestive Health Reno surpass the countrywide benchmarks for quality, as determined by the GI Quality Improvement Consortium (GIQuiC), a non-profit collaboration of the American College of Gastroenterology (ACG) and the American Society for Gastrointestinal Endoscopy (ASGE) for quality benchmarking in the field of gastroenterology. These standards include Adenoma Detection Rate (ADR) and Withdrawal Rate. Each is a unit of measure that assesses the physician’s skill to perform a safe and effective colonoscopy for each patient. What is Adenoma Detection Rate (ADR)? A polyp that may become cancerous if left undetected and treated is known as an adenoma. The most effective treatment for reducing colon cancer risk is removing adenomas during a colonoscopy. 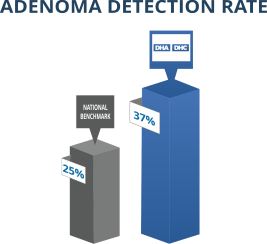 Adenoma detection rate, or ADR, is a quality indicator, that shows the percentage of patients whose cancerous polyps were successfully identified by the physician performing the colonoscopy. The greater the percentage, the more skilled the physician is at identifying and removing cancer causing polyps. Withdrawal rate is another quality indicator that measures how long it takes a physician to withdraw the endoscope, the device used to examine the colon during a colonoscopy. This measurement demonstrates the efficiency and thoroughness of examining a colonoscopy. 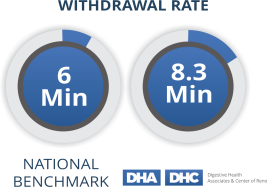 The standard Withdrawal Rate is six minutes. 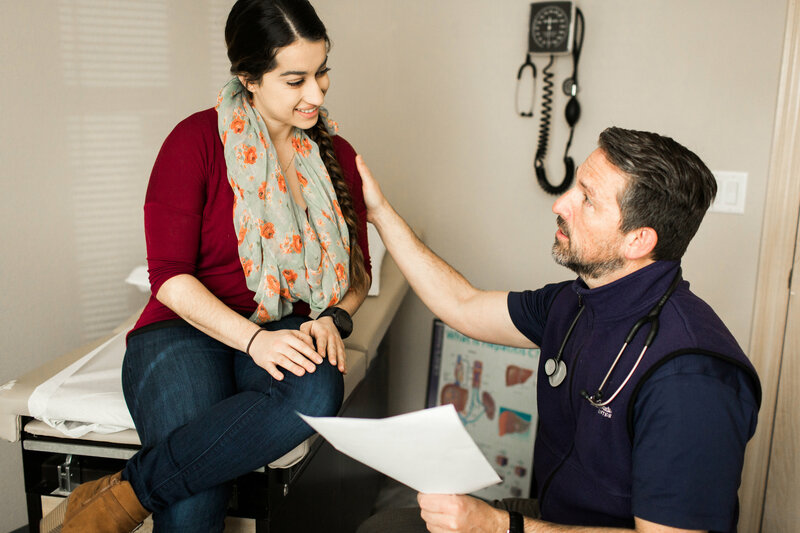 The gastroenterologists of Digestive Health Reno strive to deliver a complete examination while maintaining the highest standards of effectiveness and efficiency. At Digestive Health Reno, the average Withdrawal Rate is 8.3 minutes, exceeding the national benchmark for quality care. Digestive Health Center is nationally certified by industry leading certifying and licensing boards in the nation, so you always know you are receiving the highest level of care. Digestive Health Center is a Healthcare Bluebook Featured Facility, an honor awarded to patient care facilities that deliver premium quality care for affordable rates. Over the last 3 years, Digestive Health Center has achieved a perfect score on state and pharmacy surveys overseen by Medicare as a measure of safety and compliance. Digestive Health Center of Reno is certified by the Accreditation Association for Ambulatory Heath Care (AAAHC) a certification awarded to ambulatory surgery centers who uphold nationally recognized standards in patient care, medical safety, and operational efficiency. The survey is conducted every 3 years, with Digestive Health Center meeting all standards at 100% in 2015.